Here are a few things that I will be looking for in today's action. I'm looking for Roy-O to have a very good game. He was winless in April, but hasn't pitched that badly. In his last start, a 97 minute rain delay knocked him out after the first inning, so I expect his arm to be rested and ready to perform. 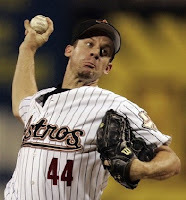 I have sky high expectations for Oswalt, when I think of his track record and competitiveness, combined with the expected production from a lethargic Nationals team looking forward to a long flight to Los Angeles. Six weeks ago, I thought Anthony Reyes was going to be good. I thought he was one of those guys who was starting the year as a #5 starter who would elevate himself to #2 or 3 position on his staff. Now, I'm convinced this will not happen. He doesn't strike enough guys out, walks too many, and gives up too many home runs. Brett Cecil is a 22-year-old left-hander, making his Major League debut. At first thought, I didn't expect much from him because it feels like the Blue Jays shouldn't be able to pull out so many good young pictures from their system. After looking at his minor league numbers, however, I think he can be very successful at the Major League level. In his minor league career (185 innings, he has given up "only" 7 home runs, has a 9.4 K/9ip ratio, and a 1.18 WHIP. The other thing to look for is if Matt LaPorta will take Cecil deep. LaPorta is supposed to at least start versus lefties. 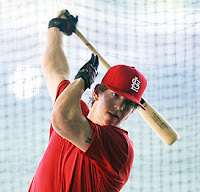 He hit his first Major League home run yesterday, and facing a southpaw today, who happens to be making his major league debut, makes me think that he'll feel right at home in the batters box again. Tim Lincecum is pitching a day game at Wrigley Field. I think he might strike out 20 guys. The other thing I want to look at is Pablo Sandoval. 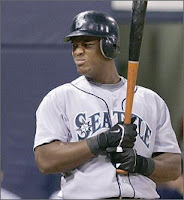 I want to see if his approach at the plate will bring up some wonderful Randall Simon flashbacks. The Cubs are a disaster. Maybe I am more anxious than I should be, but I still do not see a bullpen. Sean Marshall needs to at least get into the 6th inning because that bullpen will deteriorate rapidly if they get overused. Marmol pitched yesterday, and given his recent struggles, I'd like to give him this afternoon off. Maybe Marshall can pitch six and Samardzija can throw an old-school three innings of relief. I'm looking to see if Koji Uehara is good enough to start every five days. Of course, if he's not, that is a big problem for the O's because he is at least better than Adam Eaton and Mark Hendrickson. These Orioles have a horrible rotation and a terrible bullpen. I think the bullpen will be much better if they can actually get someone to close games, and a lights out 8th inning guy. George Sherrill is a very good reliever, but he should really be used as an incredible LOOGY who can occasionally throw to a few righties. This also may be one of my last chances to see Felix Pie starting in a Major League uniform. He, of course, was going to make all Cubs fans forget about the failures of Corey Patterson and missed opportunities with Lou Brock. Instead, he gets a chance to remind Orioles fans of the failures of Corey Patterson. I hope they keep throwing Pie out there until for at least another month. He has the "tools" to be successful and is too fast to be given up on. Lastly, I haven't checked the UZR numbers, but his defense is a plus. His range factor is above average. Will Matt Garza maintain the roll he was on last time out? He pitched 7 2/3 with 1-hit, 1-walk, and 10 strike outs against the mighty Boston Red Sox. We dropped Josh Fields and picked up Adrian Beltre in our roto league last night. I didn't want to give up on Fields and may pick him up if he shows a glimmer of getting hot. The fact that he was hit by a pitch in the arm was the last straw for us, and we are thrilled that Beltre was available. I cannot believe someone gave up on Beltre so soon. He has no home runs, and in a contract year, I could see him still topping 20 bombs for the season. Looking at this from a team dynamic, I find it exciting for the Mariners that they have been so successful early this year with almost no offensive production from 3rd base. As a team, they are doing it with pitching, defense, and (I'm guessing) timely hitting. I feel that every Erik Bedard performance is a statement game for Seattle. If he is great, they will be competitive. If he reverts back to being the sourpuss who doesn't want to compete, the M's are going to struggle on days King Felix doesn't pitch. But, having two guys at the top of the rotation being successful has a way of permeating confidence throughout the pitching staff and lineup. Twins @ Detroit. Let's go Rick Porcello!! Edinson Volquez @ Florida. The Marlins have a nice lineup, but I want to see if Volquez can dominate in a pitcher's park like Joe Robbie. Philadelphia @ St. Louis. Rick Ankiel face planted into a wall last night. I'm thinking that if he needs a few days to get the cobwebs out, this could open the door to regular at bats for Colby Rasmus. Is he going to perform like Jay Bruce, or not? Arizona @ Dodgers. I still get excited to see Max Sherzer. He's one of our favorites. Jeff Weaver, on the other hand, hasn't been one of our favorites since he was on Detroit about three lifetimes ago. Enjoy the games, go Cubs!